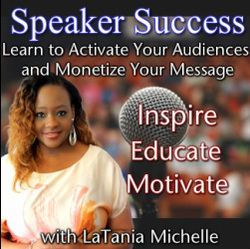 In this 1-on-1 VIP experience LaTania Michelle will pull the curtain back and show you personally several income-generating strategies that you can incorporate in to your customized Signature Talk. You will leave with the confidence knowing that you will not leave any money or leads behind at your next speaking event. This personal home study course will give you all of the strategies need to develop a successful funding campaign and help you stay focused with the proper mindset needed for success.